Kingdom's Edge book review from the Photobook. 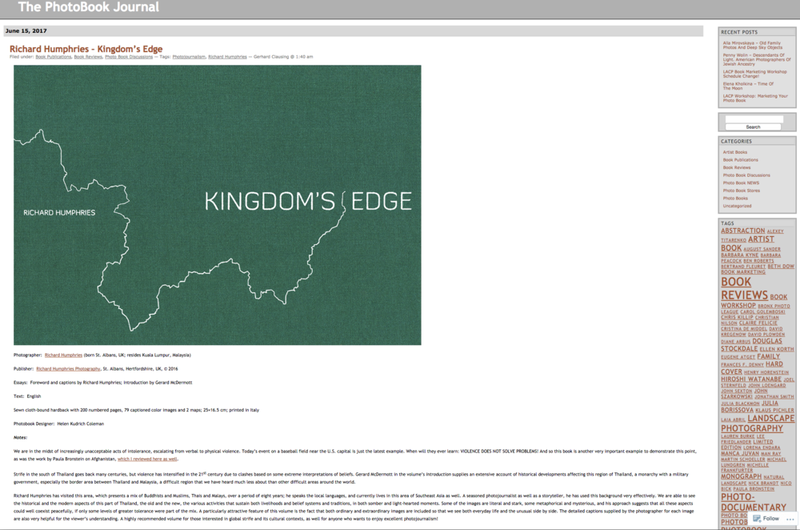 Really great review of Kingdom's Edge on The Photobook written by Gerhard Clausing. Read the full review here. Kingdom's Edge book review in The Irrawaddy. Really nice review of Kingdom's Edge in The Irrawaddy by Bertil Lintner. Click here to read the full review online. Kingdom's Edge featured on Invisible Photographer Asia. Really happy to see Kingdom's Edge featured on Invisible Photographer Asia. Thanks so much to Kevin Lee of IPA for the write up and the coverage. Check out the link below for the full write up.